A rectangular wrist rest carved from a section of bamboo. 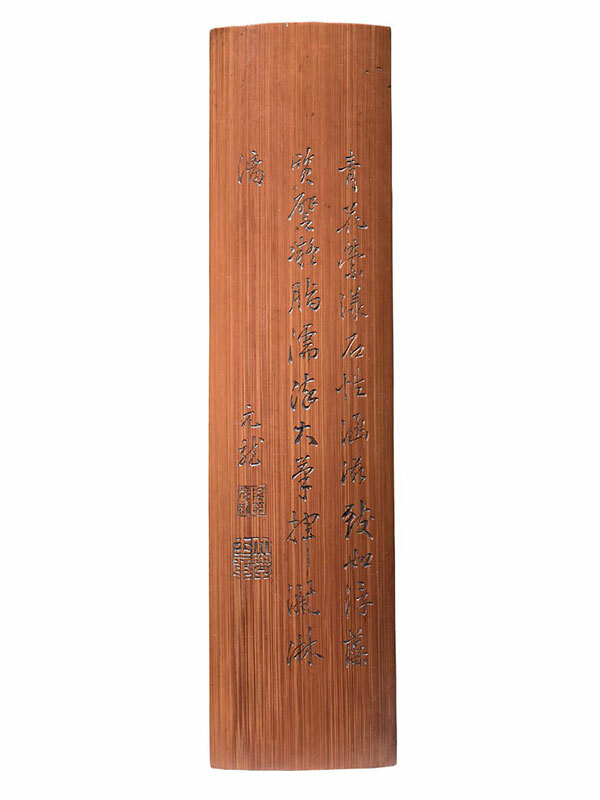 The curved, convex surface is engraved with an inscription of 26 Chinese characters in semi-cursive script and two square seals. Following a 24-character poem, the last two Chinese characters, Yuan Long, refer to the Qing-dynasty literati Chen Yuan Long (1652 – 1736). The two seal marks read as ‘Chen Yuan Long Yin (meaning ‘seal of Chen Yuan Long’) and ‘Da Xue Shi Zhang (‘seal of the Grand Secretary’)’. The bamboo has acquired a dark amber patina. This piece was in the Shuisongshi Shangang collection, then later in the Mary and George Bloch collection; it was sold at Sotheby’s Hong Kong in the sale ‘Scholarly Works of Art from the Mary and George Bloch Collection’ on 23rd October, 2005.